If you’re in the market for Amish-made furniture, you probably already know a few things. You probably know that Amish furniture has a reputation for exquisite craftsmanship and quality. You probably know they only use real wood carefully selected for each piece. And, you probably know each order is lovingly and personally crafted to last, making each item more than a piece of furniture … it’s an heirloom. The furniture styles typically associated with modern Amish designs are the Shaker and Mission styles, which are known for their simple, classic lines. The common misconception is that these styles are “old fashioned” and don’t work well for homes with a more modern design. That is not true. The beauty of Amish-made furniture is that the simplicity of the pieces makes them easy to assimilate into a variety of decor. And, while our artisans do employ techniques that have been handed down over generations, they also work to make sure their pieces are timeless and will beautifully complement your home for a long, long time. While most people are aware that the Amish build beautiful furniture, their talents are frequently overshadowed by curiosity over their lifestyle. Their avoidance of technology and adherence to a simpler way of life has left outsiders fascinated by their ways but with little understanding of how their communities operate. 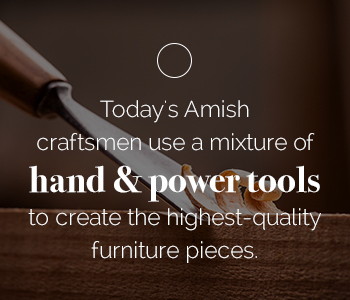 For example, most people assume that because many Amish avoid media, electricity and certain “modern” conveniences, their furniture must all be crafted without the assistance of power tools. And they also assume that the Amish only build tables and chairs and a few select wood items. In actuality, none of that is accurate. Not only do the Amish incorporate the use of power tools into their work — although manual techniques are still frequently employed — but their craftsmen have also developed a reputation for building a wide variety of beautiful, unique home furnishings far beyond simple tables and chairs. We think you’ll be pleasantly surprised at some of the Amish-made products we have to offer. Turn off the television and make use of this one-of-a-kind Amish game room table and chairs. The table is topped with a checker — or chess — board to allow quick and easy setup. Even if your children don’t want to learn the intricacies of checkers or chess, the versatile solid-wood table and chairs provide the perfect spot for card games, board games or any game that brings your family together around the table. Made from woods such as cherry, oak and maple and available in a variety of finishes, the solid table is built to hold up to food, drinks and the inevitable excitement of a game well won. Kids’ Playroom. Besides functioning as a game table, this piece can be incorporated into your playroom for a variety of uses. Instead of your kids eating goldfish and juice on your nice carpet, you can keep their messes contained to the table’s easy-to-clean surface. Or give your children a spot to draw, play with playdough or play with toys. Family Room. Create a spot in your existing space for this Prairie Mission game table. Since your family already spends so much time in this space, adding a place for games and other fun will just guarantee that this room becomes the central gathering place in your home. Kitchen. Liven up your breakfast nook by swapping out your kitchen table for this game table. With the checker/chess board in the center, your family might even start making excuses to linger over their meals and spend time together. From corner TV stands to flat wall stands and entertainment centers with bookcases attached, you’ll find the perfect entertainment center to complement your existing furniture at AmishOutletStore.com. Each of these is handmade to order in your choice of cherry, oak or quarter-sawn white oak and is carefully crafted using a method that produces a rustic-looking wood grain. Not only do our craftsmen create these beautiful pieces themselves, but they are carefully designed to provide you with a lifetime of use. While you’ll generally want to use this in the room where you do most of your television watching, our designs make them versatile enough to place in any room in your home — bedrooms, basements or any other room you can think of. And, thanks to our extensive selection of wood stains, you’ll be able to easily customize this piece to match your existing furniture, giving your home a put-together, magazine-worthy look. Do you plan to store files in your desk? If so, then a corner desk with extra storage alongside it might be a good choice for you. What color wood stain would compliment the other existing colors in your office? For example, if your office is painted in a darker color, a lighter desk might provide an interesting contrast. Do you want to be able to close up your desk when you finish at the end of the day? If so, you might want to look at our computer armoire. How much space do you have for a desk? If you’re limited on space, check out some of our flat wall options for space-saving ideas that are still big on functionality and style. There’s nothing more important than a comfortable chair when you’re sitting at a desk for hours every day. Our variety of chairs features low and high back options and padded armrests. We also offer waiting room chairs, client chairs and a variety of other options to make your office comfortable for clients, too. In addition to providing exceptional comfort, our beautiful designs will enhance any office decor. Used to conduct important business meetings, a conference table should be both gorgeous and durable. By featuring one of our Amish-made tables in your conference room, you communicate to your clients that you care about quality and longevity. Just like all of our other furniture, you are able to customize your table to fit your office decor. Choose from maple, cherry or oak and then select a gorgeous stain to finish it off. We know not everyone goes to work in a traditional office setting. That’s why we’re excited to offer Amish-crafted workbenches for our customers who work with their hands. The Murphy Workbench includes corkboard above the tool rack, aluminum covers, dovetailed drawers and full-extension drawer slides. The perfect compliment to any workshop, it’s sure to inspire any craftsman to greater creativity. Perhaps one of the more unique items we sell comes in our line of pet furniture. Yes, that’s right. Pet furniture. While you might not normally purchase custom, hand-crafted pieces for your pet, we think it might be time to reconsider. Whether you’re shopping for a bed, a gate or even a set of stairs to help your older companion, our sturdy furniture is built to withstand your pet’s hair, nails and energy. Unlike mass-market options, our one-of-a-kind products are built to last, keeping your pet comfortable and happy throughout their life. And, as an added bonus, they are beautiful pieces that will compliment your existing home decor. Perhaps one of our most unique items is our Caledonia Pet Coffee Table. Designed to look like a coffee table, it combines the elegance of traditional Amish furniture with the functionality of a dog crate. This piece features aluminum slats on all four sides, a two-inch thick orthopedic foam pad and water-resistant pad cover and a door that latches shut to keep your pet safe when you’re gone. We especially love this piece because of the functionality it offers pet owners everywhere. Get rid of those bulky, unsightly metal crates that you desperately try to hide when company comes over. Now, you can keep this beautiful piece front and center in your home at all times. If you like the idea behind the coffee table but don’t need a piece that large, we also make the smaller Caledonia Pet End Table option. This stylish end table comes with a door that latches, or you can order our Open End Table option if you’re simply looking for a comfortable place for your pet to sleep. The Classic Early American look won’t ever totally go out of style with our sophisticated upholstered chairs and sofas. While they look elegant, they’re also designed with durability in mind, so you can use them every day and not worry about longevity. Many people choose to incorporate our upholstered pieces into a formal living room, but they also look great as a compliment to a bedroom set or even as a piece in the entryway of your home. When you’re decorating a nursery, you want gorgeous furniture pieces that are also durable. After all, no one is harder on furniture than children. That’s why our extensive selection of cribs, changing tables and dressers is crafted with the highest-quality materials. And, because each piece is handmade, our craftsmen work on each piece as if they were creating it for their own little one. Whether you’re looking for a more traditional furniture set or you’re hoping for a modern look, you’ll find everything you need here. And our cribs are all conversion cribs, offering a three-stage adjusting system, meaning it will grow with your baby into a toddler bed and, with purchase of conversion rails, eventually a full-sized bed. And don’t forget about a high chair. Our traditional wood high chairs are a great option for your baby when they’re ready to join you at the table. As your child grows, their room will become their sanctuary. Help them create their safe space with our child’s rockers — the perfect addition to a young child’s room. Not only do we offer a variety of styles, but these solidly crafted wooden chairs are sturdy enough to stand up to all of your child’s energy and enthusiasm. Each rocker is made from your choice of rough, sturdy, northern kiln-dried hardwoods such as oak, cherry, hickory and maple. We realize it might be difficult to decide which chair is right for your little one. Thanks to our wide selection, you can choose between round and square backed. And you can decide between our simpler designs, like the Child’s Sheaf Rocker, or our more decorative options, such as the Child’s Acorn Rocker. One of the great things about our rockers is that they are easy to incorporate into your child’s existing decor. You can easily toss a throw over the back of the chair to give the room a laid-back look. Or, you could purchase two matching rockers to pair together and create a cozy nook where they can read and play with friends. Our large assortment of Mission- and Shaker-style wine cabinets are the perfect addition to any kitchen or dining room. Built as gorgeous furniture pieces, our craftsmen don’t skimp on functionality either. You’ll find cabinet lighting, adjustable shelves and dovetailed drawers among our many features. While most people will keep these cabinets near where they eat, their elegant, versatile design means you can always opt to use them in a less-traditional spot that will showcase your beautiful furniture. A well-made kitchen island will provide you with extra storage space, as well as extend the amount of space you have to prep meals. Thanks to our customizable options, it’s easy to have one of our hand-made kitchen islands created to blend seamlessly with your existing kitchen decor. Not only are you able to customize the appearance of your island, but we also offer options for open shelving, butcher blocks and more. These days, everyone has become so attached to their phones, we often don’t think about incorporating a clock into our decor. But these beautiful wooden McCoy and Morgan clocks provide the perfect way to accessorize a room. Featuring Hermie battery-operated quartz movement and known for ensuring durable, accurate timekeeping, these clocks are built to last. One of our favorite clock options is our Wine Rack Clock. Holding up to 12 bottles of wine, as well as a number of wine glasses, this piece combines functionality with beauty for a one-of-a-kind piece of furniture that is sure to be the center of conversation at any gathering. When you order a custom piece of furniture from AmishOutletStore.com, you have the chance to select the type of wood you would like to use. Every piece is available in oak and cherry, and most can also be made in maple, walnut, quarter-sawn white oak, brown maple and hickory. Along with choosing the wood used to construct your furniture, you will also be able to choose from a variety of stain colors, ensuring that your customized piece will coordinate perfectly with your existing furniture. As mentioned at the beginning of this piece, one common misconception we encounter is the belief that Amish craftsmen do not use power tools to create furniture. While their beliefs do mean they limit exposure to technology and stay off of the public power grid, modern Amish farms frequently rely on “pneumatic and hydraulic tools that are powered by gas or diesel compressors.” What this means is that, while the practices of each shop may vary, today’s Amish craftsmen use a mixture of hand and power tools to create the highest-quality furniture pieces. We take great pride in the fact that our pieces are handmade based on each order. Not only are all of our pieces made to order based on your wood and stain preferences, but some can be adapted to your size specifications as well. This is the beauty of our made-to-order products. We don’t offer you a pre-made piece that’s been sitting around in a warehouse somewhere. We work with you to create exactly the piece you are looking for. Our goal is for you to be happy. And we think this is the best way to do that. Arriving here during the 18th Century after fleeing persecution in Europe, the Amish initially settled into what is today known as Ohio before branching out to other communities around the country. Believed to be one of the fastest-growing people groups in the United States, today’s Amish communities can be found in 30 different states, with Ohio continuing to house the largest Amish population. What many people do not realize about the Amish is that they are divided into four primary groups, with each group following a variation on rules and order. This variation is why so many people know so little about them. This mystery is also perpetuated by the Amish tendency to avoid assimilating into modern culture. They tend to congregate in more rural areas, meaning they have traditionally been farmers. However, over the last century, they have begun to branch out and today are also widely known for a variety of professions, including beautiful woodworking and furniture craftsmanship. Their talent and success in woodworking began to take shape during The Arts and Crafts Movement, started by critics of the Industrial Revolution who were disenchanted with the mechanization of society that began in the 19th century. The movement was not so much about arts like painting and sculpture, but more about using high-quality materials to create everyday items that were both beautiful and functional. Because the Amish way of life fit quite well into this movement, people began to take notice of their simple yet beautiful craftsmanship, and demand for their work quickly rose. In a modern world that has a tendency to demand quantity over quality and speed over all else, the Amish method of furniture making is a breath of fresh air. And that is why AmishOutletStore.com is proud to offer unique furniture pieces handcrafted by talented Amish artisans. To us, Amish furniture and decor are more than just functional — they add artistry and beauty to any home. And that is why we strive to make sure that our customers get the exact piece they want, each and every time. Locally owned by the Hilty family out of Smithfield, Ohio, AmishOutletStore.com crafts furniture using northern kiln-dried hardwood. We never use pressboard, particle board or any other kind of manufactured product. Our products use all-natural, real wood pieces. When you order from us, our craftsmen get right to work, creating an American-made piece with your exact preferences and specifications in mind. Not only does that limit our environmental footprint, but it also means you can be confident that your order was created just for you. We look forward to working with you to create your next family heirloom. We are certain you will be glad you did. Contact us today for a free quote on your one-of-a-kind heirloom piece.